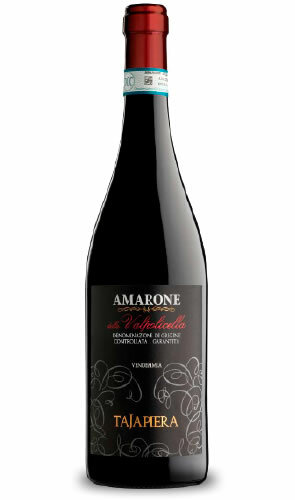 Tajapiera Amarone della Valpolicella Italian wine. L&P Global. Corvinara (60%), Molinara (30%), and Rondinella (5%); plus a further 5% of other local grape viarieties. In October, only the smallest, driest and most mature grapes are selected for picking. In February the dried, condensed grapes are softly pressed and put through maceration, then a long, slow fermentation is carried out in stainless steel tanks at a temperature of 25°C. Fermentation lasts for 45-60 days. After, wine it is kept ion its fine lease for 3 months, then racked and aged in Slavonian oak barrels for two years. Deep and vibrant red in colour with an intense bouquet of blackberry fruit. The palate is rich, very full-bodied, and well-rounded. Perfect accompaniment to cold starters, seafood, foie and cheeses.